This entry was posted in Statistics and tagged Big data on June 9, 2018 by pmean. This entry was posted in Statistics and tagged Big data on April 3, 2018 by pmean. This entry was posted in Statistics and tagged Big data, Professional details on March 25, 2018 by pmean. This entry was posted in Recommended and tagged Big data, Teaching resources on March 23, 2018 by pmean. This entry was posted in Statistics and tagged Big data, R software, SQL on January 26, 2018 by pmean. This entry was posted in Recommended and tagged Big data on January 2, 2018 by pmean. This entry was posted in Recommended and tagged Big data on November 27, 2017 by pmean. This entry was posted in Recommended and tagged Big data, R software, SQL, Teaching resources on November 15, 2017 by pmean. This entry was posted in Recommended and tagged Big data, Teaching resources on November 15, 2017 by pmean. Recommended: This is your machine learning system? 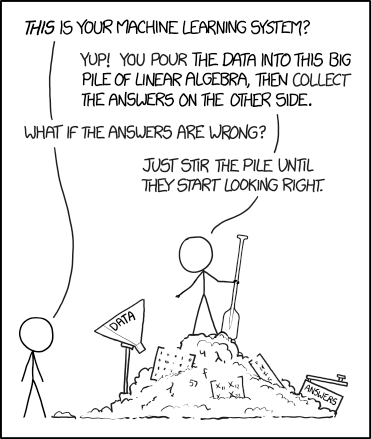 This xkcd cartoon by Scott Munro is open source, so I can hotlink the image directly. But if you go to the source, https://xkcd.com/1838/, be sure to hover over the image for a second punch line. This entry was posted in Recommended and tagged Big data on May 18, 2017 by pmean.